Yves Boulay Transport Hélico 616 459 N.-B. inc.
Maritime eggs, Eastern eggs and Maritime Pride poultry : These three companies under common ownership specialize in the production of table eggs. On the farms, there are different hen houses for two types of birds: egg-producing hen and replacement pullets. 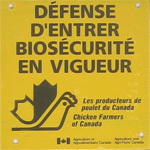 As is the case for all other Groupe Westco hen houses, biosecurity is a priority in order to prevent any infection. The eggs are collected automatically and refrigerated trucks transport them to the egg grading station to prepare them for resale. Birds lay eggs when they are aged from 20 to 72 weeks old. They are then sent to the slaughterhouse for consumption. • Production = 15 million eggs per year. • Production barn with a capacity of 46 000 hens. • Replacement barn with a capacity of 46 000 hens. 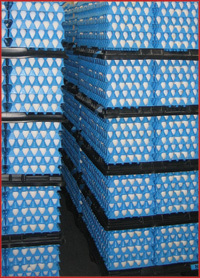 • Production = 60 million eggs per year. • Production barn with a capacity of 180 000 hens. • Replacement barn with a capacity of 180 000 hens. A hen can lay up to 324 eggs per year. - and ultra (70 g). Maritime Pride eggs : In 2006, this joint venture opened a new egg grading station in Amherst, Nova Scotia. Unique and a front-runner in the field, this new plant centralises the activities of its four predecessors. Maritime Pride markets over 15 million dozens of eggs each year. These eggs arrive from different farms and enter the plant in a fully automated fashion. They are washed and rinsed before being candled to detect any defect (blood, impurities or cracks). The eggs that are free of imperfections are then separated into categories, dated and packaged. The plant will soon begin the production of liquid eggs. The whole process from the farm to the store takes less than 24 hours. We can say with pride that our eggs are fresh from the farm… every day! Volailles Acadia : Aquired in 2006, this joint venture is a large poultry producer in New Brunswick. Located close to Groupe Westco’s other installations, this new partnership will further increase the operation’s profitability. Volailles Acadia produces 17 % of the meat-type chickens and 23 % of the tom turkeys in the province. The company sends over 6.5 million of kilograms of chickens and turkeys to the slaughterhouse each year. Developed and operated in the same fashion as the other Groupe Westco farms, Acadia’s hen houses are constantly monitored by agronomists and veterinarians who ensure the good health of the poultry. The maintenance team and personnel ensures the quality of the installations, as well as the safety and comfort of the birds. Nutritec : Taking the environment at heart, Groupe Westco and its partners have decided to collect the chicken manure and to convert it into a top-quality organic fertilizer. The product is first dried and pasteurized before being cubed and bagged. Golf course owners, for example, already recognize its efficiency for grass. Since it is commercialized by Envirem Technologies, our compost is sold on New England markets. Yves Boulay transport : This company is responsible for the cleaning of the poultry barns. This is an important undertaking, since all the poultry barns must be cleaned and disinfected between each production cycle. This partner also ensures the transportation of the manure from the farm to the compost site. From there, the raw manure can take different paths: sent to peat bogs, added to agricultural land or sent to Nutritec. Hélico 616459 N.B. inc. : This helicopter company is jointly owned by Groupe Westco and forestry company Aménagement forestier Portneuf. The helicopter allow the owners to travel from one installation to the other, located across Canada. Air travel, in addition to being a necessity, helps to save precious time. The helicopter is used for traveling as well as for surveying poultry and forest properties.